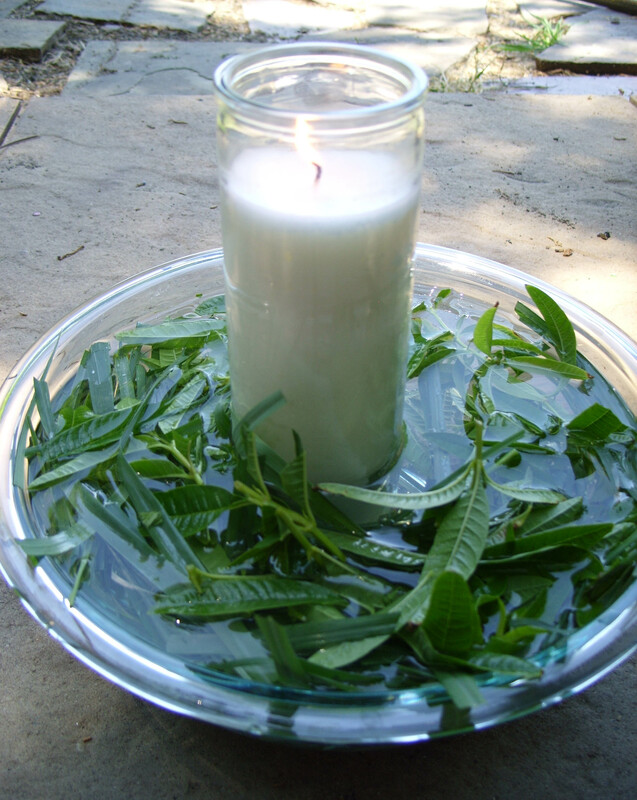 Wisdom and Joy — Girl Scout Campfire Song when starting any sacred fire. 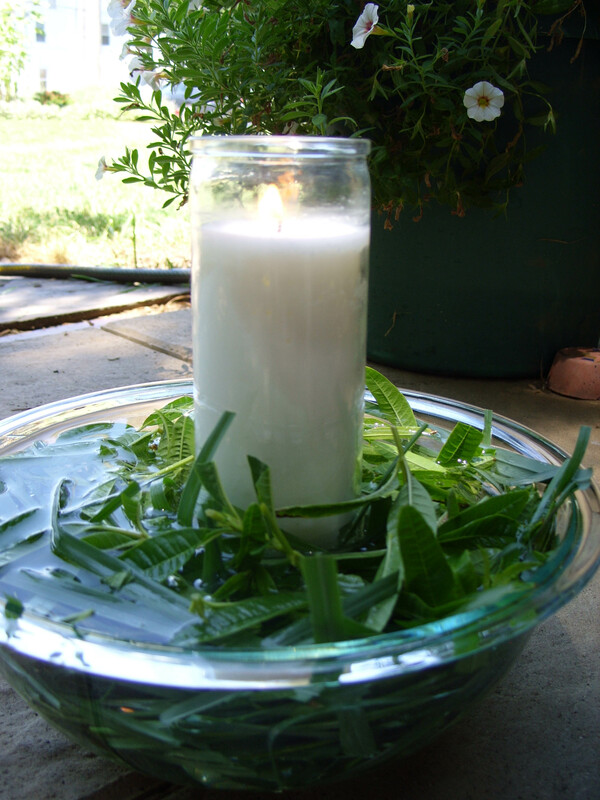 The water stands for both the moon and sun in Cancer (this eclipse), the water also stands for its own element, the herbs correspond to earth and cleansing, the white candle for the element of fire, and the song (or your favorite chant) is the holy breath (air). Light your candle before the eclipse to soak up the energies that lead up to and include the eclipse. If you can, and the flame will hold, place your bowl of water and candle outside with a clear view of the heavens. Use your favorite incantation for healing right as the eclipse comes into form, or use the caption incantation above if you like. Bottle, refrigerate and share the water with magickal friends, or use in your own workings for healing, happiness, and future good health. to lift the heart and plant the seed. 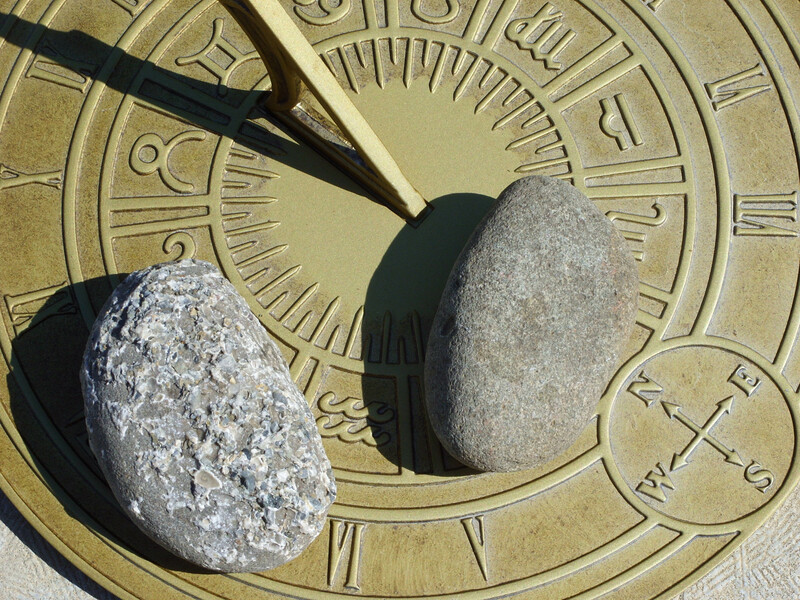 Just two stones and the direction of sunshine. We’ve all been there. The beast creeps up on you. Slowly. Silently. With great stealth. Then…wham! Your breathing becomes shallow, there’s pressure at your temples. Your mind races. You might shake, feel a tenseness in your shoulders, or a rush of adrenalin. Tears may threaten or actually flow. You feel… lost…alone…helpless. That git-er-done part of you has gone up and went. Flew the coop. Took the last train to Nashville. Shuffled off to Buffalo. Whatever. Your mind dull, your feelings in the shitter. “Yeah, Pop? And what was that?” I sat back in my chair and picked up the crochet project I was working on. My brow furrowed a bit. I didn’t exactly understand where he was going with this. And more often than not these days, such revelations never went anywhere. “You must have had a lot of fun,” I said lamely, concentrating on my stitching. Actually, I’d seen the phenomenon myself as a child. Stand one place and the summer rain hit you full force. Take six steps to the left, and…sunshine. I can also remember one day in deep summer, maybe July, just like now, where the rain fell in torrents in front yard of our house — but, in the back yard? Bright sunshine. My friends and I raced from the front of the house to the back several times, laughing and screaming at nature’s sprinkler system. Except, I didn’t mention this to Pop. You see, when you are caring for a person with dementia, it is highly unlikely they will remember what you said to them at any given moment. So, instead I said, “I think that is remarkable, Pop.” He told me the story two more times, and each time I changed my response in an effort to be supportive and positive. After he left the table to watch the Western Channel (that’s all he watches), I sat at the table, contemplating his story. You see, at one time in his life, Pop was fairly psychic. Not the famous kind — he would just know things, especially if I was in trouble. Out of the blue he would ask me what was going on, and once, when I almost died in a car accident, he knew the second of the impact, even though he was miles away. I have always attributed this to the Braucher lineage in the family, and not thought much of it, other than I knew for a fact over many experiences that he could tap into the ability when necessary. Right this moment I’d been sick for several days with a nasty summer cold, so I wasn’t feeling particularly energetic or even kindly; yet, I knew somehow his story was important. It came to mind that we all create our own field (that which flows around us) with our thoughts. Indeed, to me, my world may be dark and ugly and filled with responsibilities coated in snot and dirty tissues; but, to the person standing ten feet away from me (let’s say) their field right now may be filled with sunshine and happiness. Every field, said my brain, has an edge. We just don’t see the edges, and therefore assume that our field extends beyond our ability to view the defining line which we can’t see, so we don’t realize it is there. In our refusal to admit that it is there simply because we can’t physically see it, we find ourselves powerless to change our field, or break through that rain cloud — when really, sunshine for the enjoyment is just a step away. Every rose may have its thorn, said my brain; but, so too, every field has its edge. And every field, no matter what it consists of, can be changed and transformed. The question then, would be — how does one change the field? By realizing the field that you have created has the limits you put there in the first place. Spells, rituals, charms, incantations, conversations, the art of placing objects, movies, books, music, art, the internet, physical actions and more all alter your field — yet, the most important control mechanism you have in making positive or negative change is your thoughts. All else is supplement. Your thoughts guide your ship. Your ship crashes and burns or reaches the moon all on the base structure of what you hold in your mind to be true. You can walk out of the rain anytime and into the sunshine. And that’s what magick is all about. Working with the totality of the world around you (plants, candles, bits of paper) and infusing your thoughts with a positive connection to Spirit (whatever that my be in your mind) in the focused direction of change — which, transforms your personal field. So! Right now, on this day of the eclipse, I want you to realize that you have a field around you, and the field does, indeed have an edge. Your field is totally under your control. Do you like what is in it? No? Okay, let’s pick the very worst thing that is going on in your life right now. Don’t turn away. Face it. We’re going to get rid of it. We are going to change your field. Right now. Get two rocks. Any two rocks. The (your problem) abated, and the dragon skee-ated. (Skee-ated means disappeared). Are you laughing yet? It is a funny chant, truly, and you are meant to smile. Really! Do it again, nine times. Do you feel your field changing? If the answer is yes or no — Do it again! Now, with one of the rocks, draw an equal-armed cross on the ground three times, and say: This I credit unto thee as the true nature of Spirit. Everything Gets Right! So mote it be. Bang the rocks together one more time. In all, the chant is to be done 27 times in one sitting. Do it again, 27 times, this afternoon or at dusk, and then again right before you go to bed. By tomorrow it won’t hurt. Or, at least, it will hurt less. The more you work to redefine your field, the better your field becomes. If you are dealing with a particularly nasty problem, do the same, simple working for the next two days, or the next six (making three or seven days in all). Feel free to list your comments here on the blog on your results. The chant, by the way, is of Hohman derivation, circa the 1856 copy of his book, Long Lost Friend printed by T. F. Scheffier, Harrisburg, PA. wherein Hohman states: This book is partly derived from a work published by a Gipsey, and partly from secret writings, and collected with much pain and trouble, from all parts of the world at different periods by the author, John George Hohman. To add a little more gusto to the working, cut four small twigs. Wrap each twig with a piece of one of your old shirts. When you sit down, place one twig/shirt piece behind you, one twig/shirt piece in front of you, one twig/shirt piece to the left, and one twig/shirt piece to the right. Burn all four twigs/shirt pieces after you finish the chant, saying as it burns: Evil be gone, do not return, the horse has run off and the bridges are burned! Yes, you can bang your rocks together while the wood and material burns. To really put the zing in this working, gather the twigs at one of the four Pow-Wow Hours — At dawn, at noon, at dusk, or at midnight. So there you have it — a reason for nonsense. Every story has its meaning.